Brief Synopsis – An aspiring musician joins a new band where the lead singer walks around all the time wearing a paper mache head in order to conceal his real identity. My Take on it – When Tony gave me this film to review, I thought it would be something completely else because I just assumed that this film was either a cartoon or a film set in a different world. I had no clue that this was a film about aspiring musicians. They have some great ideas here but instead of them being presented well, it takes too long to get to the point and stays quite strange and weird throughout most of the film. They do touch upon some great messages but they aren’t always as clear as one would hope. The cast is superb with Domhall Gleeason, Michael Fassbender, Maggie Gyllenhall all feeling a bit wasted here. They do a nice job of throwing around the idea of what makes a band popular; is it via true talent or is it more related to the act of aspiration and tenacity via self promotion that makes things work in the end. The mystery of the lead singer with a paper mache head goes on for too long and I for one, felt a bit let down when the reasons behind it all were finally explained. Bottom Line – Very strange film that has some great ideas but they just don’t work as we;ll as I would have hoped they could. Great cast is somewhat wasted here. They do a nice job of bringing up the whole issue of what is a band really made up of, talent or is it possible to have a group of musicians aspiring for so long that they might get popular. 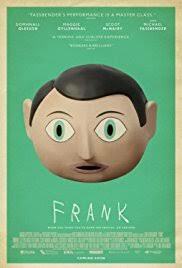 I really liked Frank. I loved the parallels between Jon and Frank’s home lives and the idea that the difference between mediocrity and genius could just be a touch of madness but that touch could also mean the difference between success and anonymity.